The war between the North and South (1861-1865) was one of the most tragic in all of our nation’s history with loss of life totaling more than those lost during World Wars I and II, the Korean War and the Vietnam War combined. Our homeland was a “house divided”. Not only were upwards of 750,000 men lost, but women became widows, and children became orphans. It is with the deepest honor that the people of Barbour County erected the flags that fly over the Blue and Gray Park. The flags are replicas of the five that flew proudly over Philippi during her dark days during the Civil War. The Blue and Gray “mini-park” is a memorial in honor of those who served and died. 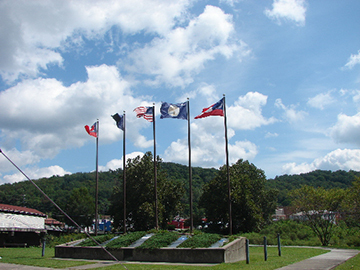 Blue and Gray Park is located on the US 250/Route 119, at the west end of the covered bridge that spans the Tygart Valley River coursing through Philippi. Follow the sidewalk from the bridge to the park and you can reflect upon those who served in Barbour County. There are two concrete boat ramps near the park and bridge providing the perfect launch for a peaceful afternoon of boating or fishing on the river near this beautiful monument.